Keep silk looking fresh by hand washing away dirt and stains. 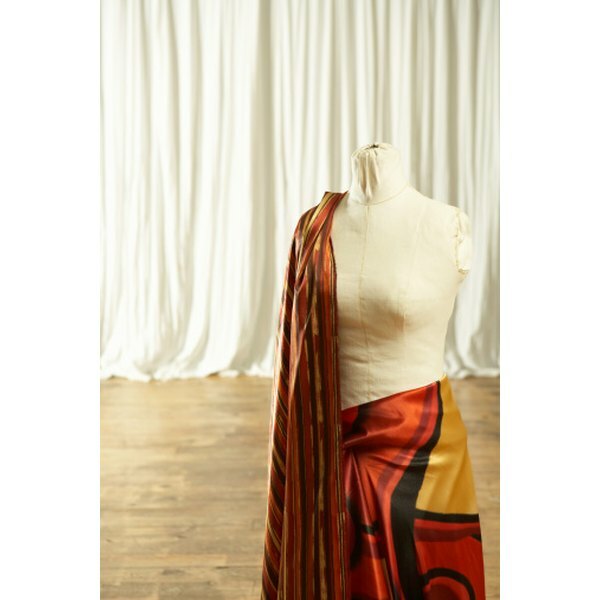 Dupioni silk is a handwoven silk that is traditionally dyed with a variety of vegetable-based dyes. Newly woven, the silk is stiff to the touch. Washing the material however, softens it and shrinks the silk by up to 25 percent. This shrinkage is problematic when dealing with store-bought clothing, but by washing the fabric before sewing, you can get the shrinkage out of the way, creating a garment that holds it shape and size no matter how many times it’s washed afterward. Fill a sink with lukewarm water. Add a mild soap like Ivory powder or Woolite to the water, stirring the solution until it begins to lightly suds. Place the dupioni silk into the water and soak it in the mix, rubbing the fabric lightly for about 5 minutes. Avoid clumping the material or pulling it out of shape during the washing process. Remove the fabric from the water, and drain the sink. Rinse the soapy residue from the sink with cool running water. Fill the sink a second time with lukewarm water and add 1/4 cup white vinegar to the water. Soak the fabric in the vinegar solution to neutralize the soap. Remove the silk from the water, and then drain the sink, rinsing it out with cool water. Rinse the fabric in cool water as well, to remove the smell of the vinegar. Do not stress or wring the material, as this could loosen the weave. Lay the fabric flat on a towel. Roll the towel loosely into a cinnamon-roll shape, and then set the towel and silk aside. Allow the material to dry overnight. Wash dupioni silk before sewing it into final shape to avoid shrinkage on additional washings. The silk will shrink after the first wash. Dyes may run during cleaning; test a small area of the silk before washing the entire piece to determine if your fabric runs. If so, dry-clean the material only.